Vervain has a long and beautiful history as a cleansing herb, among other uses. Ancient Egyptians dedicated vervain to the Goddess Isis and used it as a common ingredient in love potions. The Ancient Druids used it to cleans sacred spaces and in divination. The Ancient Romans followed the Druid’s lead and used vervain to ritually cleanse their homes and temples. Some also placed vervain on their altars in honor of Venus and Diana. Legend has it that King Solomon cleansed the Temple with vervain which is not in the Tanakh (Old Testament) but it wouldn’t surprise me considering it’s widespread use during this time period. Vervain is known scientifically as Verbena officinalis and was brought to North America by the Puritans. (Does anyone know how the Puritans used it?) Today vervain is still used among Pagans and others for the ritual cleansing of sacred space and is also incorporated into a wide variety of charms and spells. 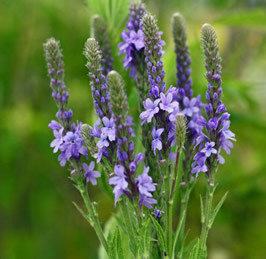 It also has an American cousin, blue vervain, which is also called verbena. Its scientific name is verbena hastata. Both have beautiful flowers but the herb is usually harvested before the flowers appear. For those who want to plant it in their herb gardens and flower beds, vervain likes the sun and is not particular about the soil its grown in. It’s a fairly hearty perennial and will come back year after year. I’ve also heard it said that bees and butterflies love it so that’s another good reason to plant this wonderful herb in your garden! This entry was posted in Creation Spirituality, Herbology and tagged Spirituality, Wicca. Bookmark the permalink.